There cannot be many books whose heroine’s name is ‘Daffers’! But the heart warms to Daffers as she grapples with first her father being killed in the Great War and then her soldier brother going missing, believed killed. She tries to take up useful work, winding wool but her background has not fitted her to do very much. Then a more forward thinking aunt, whose daughter is a suffragette, draws Daffers into the First Aid Nursing Yeomanry Corps (FANY). She can drive thanks to her brother and so goes to France to drive an ambulance. There are some rather grainy photographs at the end of this story showing the real members of FANY, one lovely one of them in their fur coats! The converted cars had no windscreens because they were not allowed to have lights so this helped the vision of the road but made the drivers very cold so fur coats were sent for. 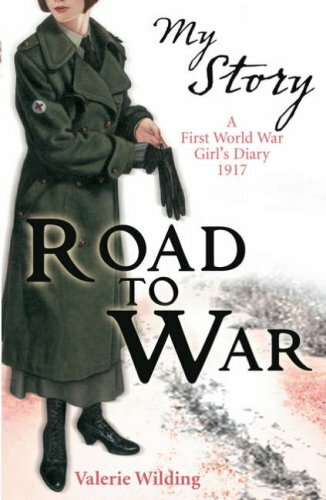 This slight and rather jolly story does not disguise the excitement these brave girls and women found in the dangerous work they did and sheds light on the organisation which endured through the Second World War. This is in the ‘My Story’ series published by Scholastic. The paper is unattractive which is a shame, but the cover is arresting and I hope would attract many readers for this brief story is a good read. A bibliography would have been of benefit to lead readers on.